In 1975, the American Basketball Association's Denver Nuggets applied to join the National Basketball Association, but were forced to stay, by a court order (no pun intended). The following year, the ABA-NBA merger took place, and the Nuggets, along with The New York Nets, Indiana Pacers, and San Antonio Spurs were officially in the National Basketball Association. To commemorate the league change, the prolific folks at Denver's Great American Music Machine penned "Go With the Nuggets." 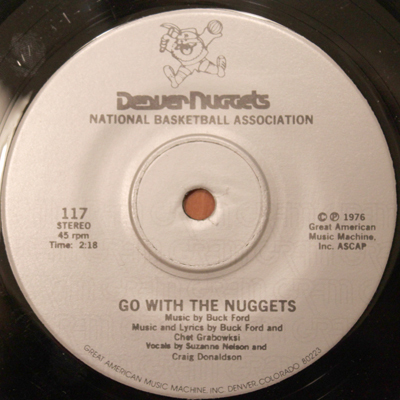 Billed as the official song of the team, "Go With the Nuggets" (written by Buck Ford and Chet Grabowski) featured vocals by Suzanne Nelson and Craig Donaldson. 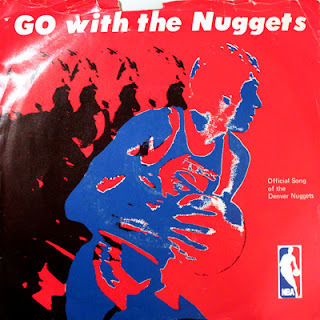 "Go With the Nuggets" would go on to be the team fight song for several years, with the Nuggets officially retiring the song in the mid 1980s. Most recently the team has opted to go with The Verve's "Bittersweet Symphony," Brooklyn Bounce's "Melody", and T.R.E. 's "Can You Feel It."